BBC America has released the airdate and a new teaser trailer for the third season of Orphan Black titled: “This Is War”. The clone drama starring Tatiana Maslany will return in the US on Saturday, April 18, 2015. Although BBC Three has yet to announce when it will air the new season in the UK, it is expected to be aired within a similar time frame. Season 2 ended with the reveal of new army of male “Castor” clones played by Ari Millen. A development that tests the friendship of the clone sisterhood; Sarah, Cosima, Alison and Helena. 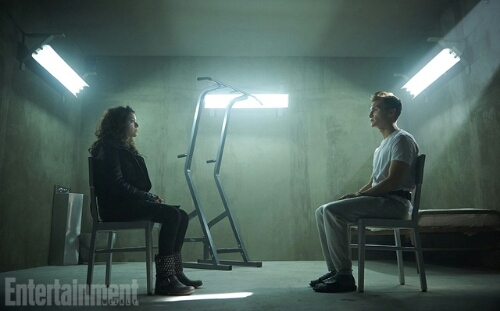 The picture (above) from EW reveals Sarah faced with her clone brother. Returning alongside Maslany is regulars Jordan Gavaris, Maria Doyle Kennedy, Dylan Bruce, Kevin Hanchard, Evelyne Brochu and Skyler Wexler. Season 3 will also see new cast additions including Brit actor James Frain, Kyra Harper, Earl Pastko, Ksenia Solo and Justin Chatwin. That looks awwwwesome! Is it April yet? it’s not even 2015 yet! it’s going to be a long wait. I’m also thrilled to learn about Ksenia Solo joining the cast! I loved her in Lost Girl!